Gold was trending lower for a sixth straight session on Thursday hitting fresh four-year lows, but a market desperate for bullish news could find it in Switzerland at the end of the month. The Swiss go to the polls on November 30 in a referendum that will lay down new rules for the country's central bank concerning its gold reserves. Surveys are divided about support for the "Save Our Gold" camp that would force the Swiss National Bank to hold 20% of its reserves in gold, repatriate bullion held outside its borders and halt all sales, but a yes vote would be just what investors who nursing a 30%-plus drop in the price over the past two years need. To meet the 20% requirement the SNB will have to buy between 1,500 – 1,800 tonnes on the open market, which at today's ruling price would set the fiscus back nearly $60 billion. Financial Review quotes Bank of America analyst Michael Widmer as saying a positive outcome may push gold above $1,350 an ounce, more than 18% higher than today's price. "If they do launch a buying program, it would have effectively a constant bid in the market." Currently, the bank has 1,040 tons of gold, with roughly 70% stored in Switzerland, 20% at the Bank of England and 10% at the Canadian central bank. 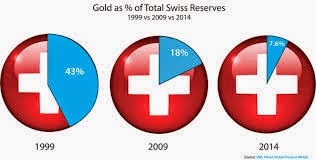 If the SNB starts buying Switzerland, it would be placed third on the list of official gold reserves by country behind the US and Germany. Switzerland produces no gold itself but it's the world's gold refining hub, a major global center for bullion vaults and boasts the world's 8th largest official hoard of gold. The country was also late coming off the gold standard and as recently as 1999 its constitution required the franc to be 40% backed by gold.